In the last blog I alluded to the fact that for the first time, Eleanor and I aren’t traveling with Emma in the Airstream. I wrote that just as we headed back out on the road in August, anticipating that things would be very different for us without our little traveling companion. I was right: driving back was a little strange. Eleanor was following me in a car for the 3,800 mile trip, so for most of the day I was alone in the Airstream with my thoughts and a few podcasts. The familiar chatter of E&e was gone, and I realized that even their silent physical presence (as they read books during the long drive) was something I missed. For a while we were just hustling to cover the miles, until we could get to something that was of particular interest. We breezed through New York with just a short stop at the Sonnenberg Gardens & Mansion State Historic Park (plenty of room in the parking lot for RVs), dropped in on our friends in Ohio for a couple of nights, and then zipped up to the Detroit area to finally hit a place that had been on my list for a while: The Henry Ford Museum and Dearborn Village. Those were great and I highly recommend both. That’s part of Dearborn Village above, at a place where we stopped to try the High Tea. It took us two days to see all of Dearborn Village and the Henry Ford (plus a couple of hours to do the Ford Rouge Plant tour), so if you go, I wouldn’t skimp on the time. The visit was made better because we camped at Camp Dearborn in Milford MI. It’s a nice place—about 30-40 minutes drive to Detroit—and the Tin Can Tourists go there annually so the staff is accustomed to seeing all kinds of cool vintage trailers. But best of all they have a nice discount ticket deal with The Henry Ford Museum, and you’ll definitely see all kinds of cool stuff there. The photo above is the interior of a Dymaxion aluminum house, invented by Buckminster Fuller. (We talked about it in the Spring 2005 issue of Airstream Life, if you still have that issue in your collection.) Being made of aluminum, the Dymaxion house is beloved by many Airstreamers. From Detroit heading west we had no planned stops at all, so for a while I was somewhat at a loss for what to do and where to go. That’s odd, since as the family navigator I usually have at least a rough idea of where we are headed. Here’s another place where Emma’s influence was critical: normally I’d be looking for educational opportunities for her. I wasn’t used to having to figure a route for two adults in their 50s. Where do childless people stop in Iowa and Kansas? Finally we decided to just plow west against the headwinds on I-80 and try to get as far as we could in the next three days. It was an uninteresting part of the trip, so this is probably a good time to mention that the car Eleanor was driving was a new Tesla Model 3, an electric car. For those who know me, it’s no surprise that I’m a big believer that electric cars will be huge in the next few years, nor will anyone be surprised that I waited to get this car for over two years. I am looking forward to the day when I can buy a Tesla pickup truck and finally get free of the dreaded “CHECK ENGINE” light and all the other hassles associated with internal combustion engines and transmissions. The car is relevant particularly along this leg of the trip because I know there’s a lot of confusion about electric cars, and one thing people often seem to believe is that you can’t drive them very far. That’s ancient history. Even against a typical Plains State headwind, Eleanor stopped for a quick recharge about the same number of times I stopped to buy diesel fuel, and her cost was about $5-10 versus the $65-80 I was dropping on diesel. A few times we charged the car for free on campground 50-amp connections. In the end, it cost $99 in electricity to drive the Tesla 3,800 miles (2.6 cents per mile). I’ve paid more than that for a single fill-up of our tow vehicle. On those nights in Iowa and Kansas where we were just parking overnight in a lot it was no problem to find a place to stash the car. 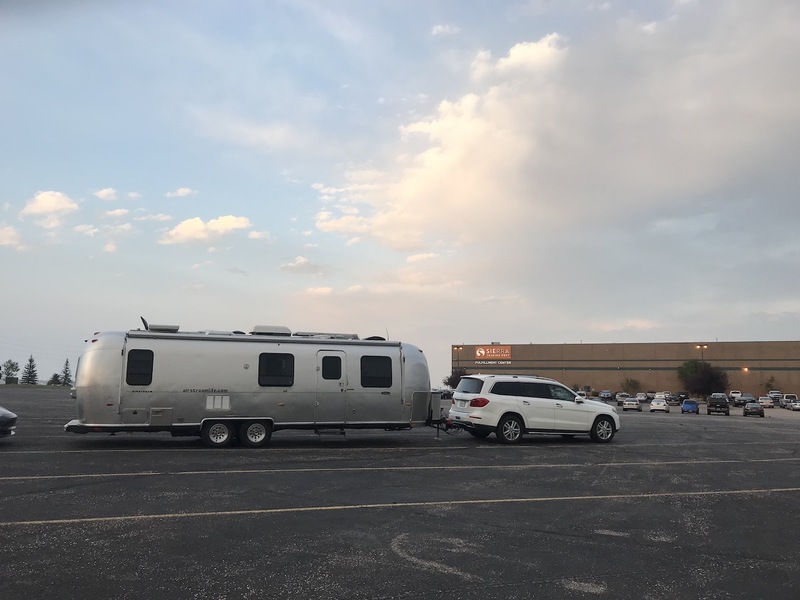 In fact it was kind of handy because we could go out for dinner without unhitching, as we did in Cheyenne WY the night we parked at Sierra Trading Post. The rest of the time we were lucky enough to get campsites with room to squeeze in the car, or at least park it nearby. If we could each the power pedestal it was a bonus, but we didn’t worry about it. Tesla’s Superchargers are conveniently spaced along the highways and the car can go over 300 miles on a charge, so we never really had any concern about where we’d charge up next—even when we got into some remote parts of Utah. Part 2 of this trip starts there. I’ll continue the story in a few days.